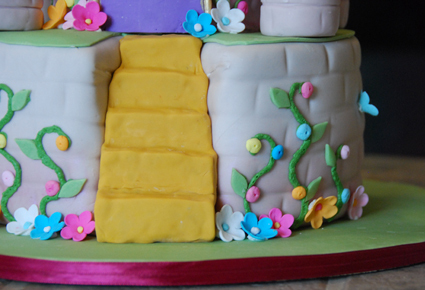 The biggest lesson I’ve learned in trying to advance my cake decorating skills is that it comes down to detail work. The more time I can afford myself to work ahead of time and focus on the small stuff, the better the result. New ideas spring up from old ones, and the cakes come out with a greater sense of completion to them. 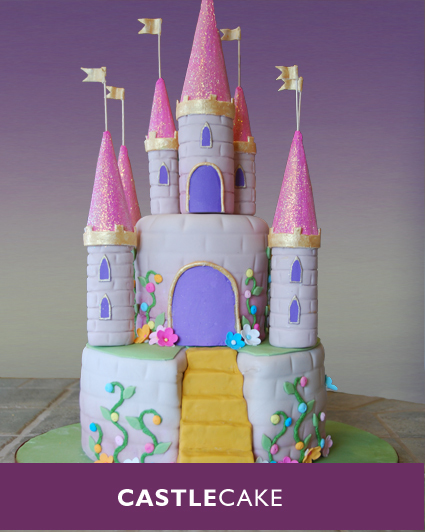 Among the many new discoveries made while working on this cake were painting with luster dust, building accessories with Rice Krispy Treats, applying texture to fondant, and more. It took a few evenings of preparation, a day to bake, and one day to assemble. After sketching the basic cake design, the next step was determining the size and scale of the cake. 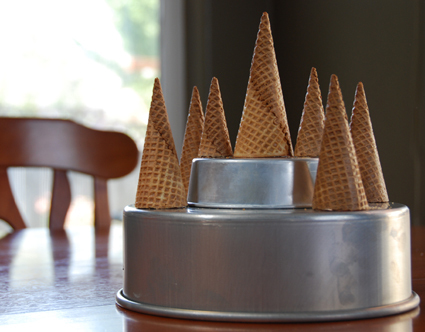 I experimented with different cake pan sizes along with the sugar cones I planned to use for the tower roofs until it looked nice and balanced. 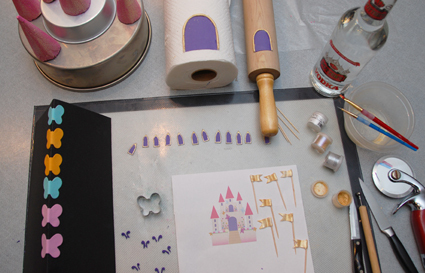 At the beginning of the week, I began to make decorations for the castle. These are all made of gum paste, which dries rock hard. I am a big fan because they stand up to my tampering throughout the week. Once the coloring and mixing is done, I like to do gum paste work in the evening in front of a good movie. It’s like play-doh time for grown ups. 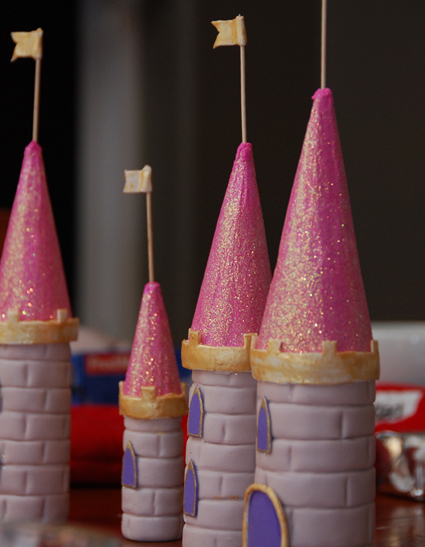 About two days before the cake was due, it was time to get started on the castle towers. 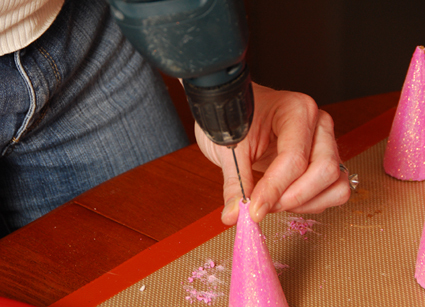 The sugar cones needed to be trimmed to different heights to make some smaller than others. 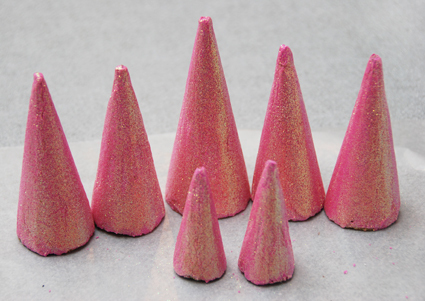 They were frosted with hot pink royal icing and sprinkled with deep pink Disco Dust – edible glitter. 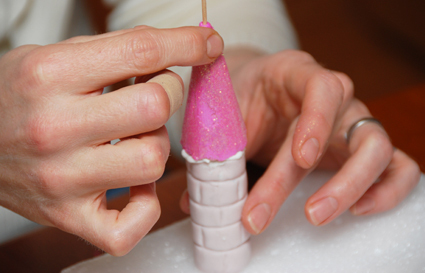 Once glittered, they were rolled on a smooth surface to remove any bumps and to give them a nice uniform surface. Because these weren’t the primary part of the cake guests would be eating, I used royal icing which dries rock hard. Again, I like this because they would not be at too much risk of getting damaged. With roofs done, it was time to shape the towers out of Rice Krispy Treats. Rolling them on a smooth surface helped to make them straight. These were then frosted with buttercream icing and wrapped with fondant. The brick texture was harder than I had expected. I used the back edge of a small knife as I rolled the tower in my hands. The placement and pressure applied with the knife had a huge impact on the look. It took a while to get the hang of it. Once they were done, however, the towers were fairly resistant to damage and could be handled easily for the rest of the assembly. Maybe this is a rookie mistake, but once the roofs had dried there was no longer a role on top for the flags. Not wanting to break them, I used a drill to gently poke a hole in the top of each roof. Then they were ready for the flags to be inserted. To paint the flags and roof trim gold, I used a gold Luster Dust and applied it with a detail brush dipped in Vodka. 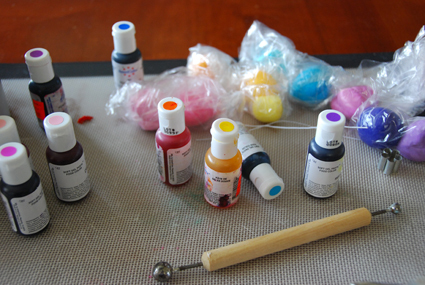 The alcohol is necessary because it dries quickly and won’t make a big mess of the frosting surface you are painting. One fun detail was the steps. I had seen this on another cake and thought I’d give it a try. 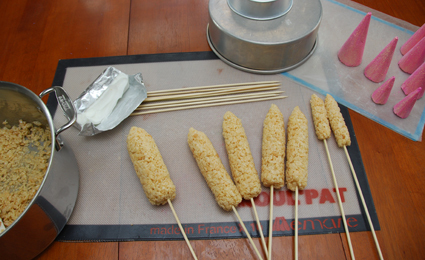 They are formed out of Rice Krispy Treats and covered with buttercream and fondant. With this suff, anything really is possible. Lighting the cake was in exciting moment. We were all a little sad to eat it, but that is the beauty of cake! I seriously hope the little darlings did not actually EAT the cake after all that work!! What a beautiful cake – the deatils are gorgeous. 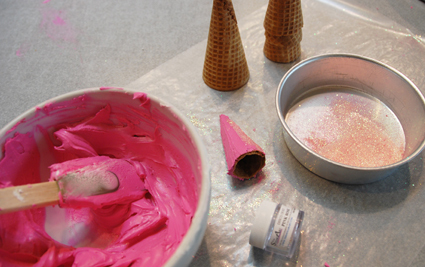 I especially like the pink glittered sugar cones. Well done, a cake to be proud of!! I love it! And I’m glad you put in your drill picture. Made me giggle! I’ve run into similar kind of crafting hurdles but I’m not brave enough to show the remedy! You are very creative and it is fun to see the end product. 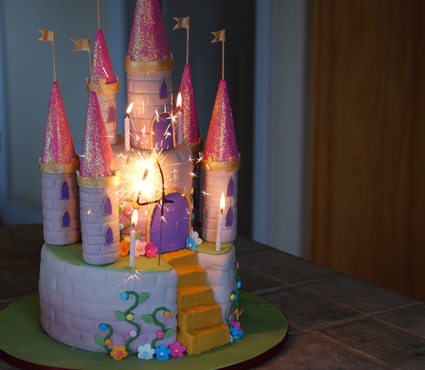 Cool candle…it was like a firework show at the castle for the birthday girl! That is so cool! Where did you find the sparkler number candle? I bought the candles at a local bakery shop, but you can also buy them online here. Enjoy!